Dad has pretty much always questioned authority, thumbed his nose at convention, and rebelled against whatever he felt like. He keeps his mind open for continuing revelations even when those are that the status quo ain’t all that bad. For example, after much study he concluded that Elvis is probably dead and aliens are probably not a direct threat, but he’s had enough of the hospital so, smell ya later. Dad, this movie is for you. Since we don’t have a television at the moment (CURSES! ), I’ve been watching a lot of digital video discs. 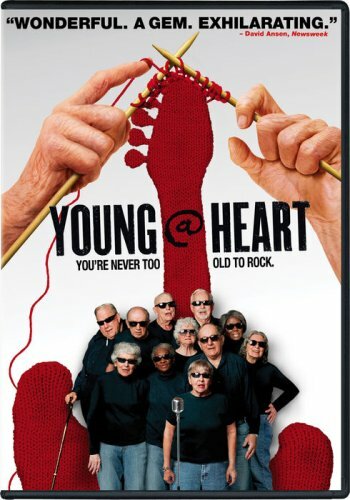 I stumbled across Young@Heart: You’re Never too Old to Rock at the Pima County Library. This movie is my new best friend and proves that punk was around long before Punk. You don’t have to have pink hair, though blue works nicely. I LOLed at this movie, but I was also deeply touched. Do yourself a favor, if you aren’t going to rent the movie, at least Google their performances of Forever Young and Fix You, though they are more powerful in context. I had dinner at “the club” with the Bendicksons the other night and we discussed the lineup for the 2010 Tucson International Children’s Film Festival. In the past they have shown movies like Howl’s Moving Castle , Egon and Donci , Azur and Asmar: The Princes’ Quest , Shaolin Soccer , Ponyo , My Neighbor Totoro , The Red Balloon, White Mane , Strings , Please Vote for Me , Microcosmos and even US films like The 5,000 Fingers of Dr. T and Creature From the Black Lagoon in 3D. This year there are only two films that interest me. Perhaps the line-up is a little too Western? I’ve seen all the movies. The solution? Saturday night Movie Time at the Bendicksons. Last week, it was on a Friday because the Bendicksons are all punk like that. They don’t need no stinkin’ badges. This week, they are going tropical with George of the Jungle followed by Tarzan . The plan is to wax nostalgic all DeAnza (RIP) like with their late night double feature picture show. Perhaps they might consider City of Bees: A Children’s Guide to Bees out of Denmark for a future screening ala Microcosmos. I always love to see insects buzzing about and kiddos running in fields in their underwear, but the narrator uses his preschool voice and that is a huge turn-off. The information is appropriate for an older kid and there is some sick propolis action. Also, there is a seven page guidebook that is a little worksheet-y and perhaps a twee young for my kids, but since the 8 YO Girl did a project on bees for Hawt Mz, she is on it like honey on a comb. And just for that local touch, the guidebook has a link to a University of Arizona URL that provides lesson plans for kids K-12. For family night, Handsome Hubster rented Airplane! That part compelling him to push the envelope is still in tact. Somewhere, I lost my obvious punk edge (never could afford the accouterments anyway) and became a little mommy-two-shoes as evidenced by my watching City of Bees with the 8 YO followed by subsequent Internet searches for further study, but deep down I have the heart of a RebL as placed by my daddy-o, who never wanted me to call him “Shirley” either. Turns out Dad’s cancer is Stage 4 and he’ll decide soon if he wants to ward it off with chemo or garlic or both or neither. I’m grateful for my dad and the community who have come out in such numbers they sometimes must wait their turn. You can follow him and whatever he chooses to tell you here. As for me, I’m off to the Bendicksons. Did I mention I am a sellout Amazon Associate? I am and even managed to make $2 off you suckers!